1. Left to Right - Sifu Tai Yim, Sifu Lily Lau, Sifu Sam Ng, and Sifu Phil Ng. 6. More impromptu chisau. 2. Amanda charges in to score on her opponent. 7. During the post tournament celebration, professional dancers were invited to perform. After their performance they grabbed members of the audience for a little Latin dance lesson. 3. 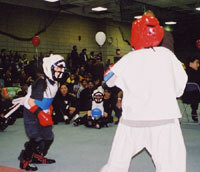 Brian looks to exploit an opening in his opponent. 8. 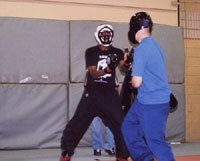 Instructor Damien Dawson volunteers for a lesson. 4. 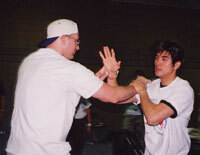 Brain and Lee compete against each other during the chisao competition. 9. 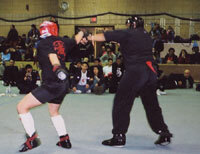 Ed sparring. 5. 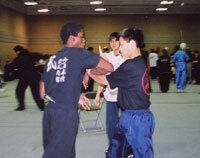 Sifu Phil Ng and Instructor Keith Voney partake in a little impromptu chisau. 10. 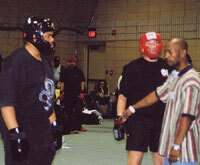 Ed waits for the next round.